Just exactly what is the difference between determinate vs. indeterminate tomatoes? Is one better than the other to grow? Can I grow both in my garden? Do I need to grow a certain type if I want to can and preserve my harvest? What about fresh eating? These are just a few of the oft-asked questions when it comes to growing determinate vs. indeterminate tomatoes. This striped Green Zebra tomato is a flavor-packed heirloom that as an indeterminate, produces fruit until the first frost. And with today’s article, we hope to answer all of those questions and more. When it comes to determinate vs. indeterminate tomatoes, both can be packed full of flavor and nutrition. And, both are perfectly fine to grow by themselves – or together in the same garden. Choosing which of the two tomato types is best comes down to how the tomatoes will be used. How you use your tomatoes is a big part of which tomato type is best. And as you will see, in many cases, it makes good sense to plant both types. With that said, let’s take an in-depth look at indeterminate and determinate tomatoes. Determinate tomatoes are varieties that bloom, fruit and mature their entire crop all at a specific time. These types of tomatoes will bloom during the same time-frame, fruit around same time, and finally, ripen their fruit during the same time period as well. The Roma is a determinate tomato variety which produces all of its harvest during one time period. And when they are done, they are done. Determinate’s can produce a big harvest, but over a compact period of time. For most varieties, that time frame is usually two to three weeks. Determinate varieties often require more robust tomato stakes and cages to support their heavy fruit load. There are many determinate varieties that are wonderful for fresh eating. Just keep in mind that the harvest is for a very limited time. But for those who like to can or preserve, determinate tomatoes are a great choice. They are the perfect way to get a big harvest, and can and preserve all at once. Determinate tomatoes are great for canning, producing all of their crop at once. They can also be a great choice for those looking to make large batches of salsa, tomato sauce, or chili and tomato soup. 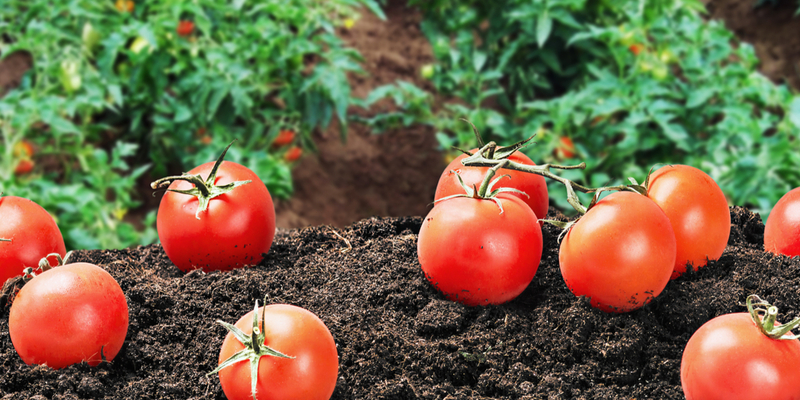 Determinate tomatoes can also be planted at staggered times. This allows for big harvests, but at different times of the season. Two great examples of prolific determinate tomatoes are the Roma Tomato and Celebrity Tomato. Both produce and ripen abundant crops over a two to three week time frame. And they are both perfect canning and preserving. Indeterminate tomatoes continue to grow, bloom and produce throughout an entire season. And they do so until the first hard frost or freeze finally takes them out. Indeterminate tomatoes like this Genovese continue to produce until the first frost. Indeterminate tomatoes constant production make them a great choice for those who love eating fresh tomatoes all summer long. Many indeterminate varieties, like Brandywine and San Marzanno, are incredible for canning as well. But remember, with indeterminate varieties, the harvest is spread out over an entire summer. Cherry tomatoes can be found in both indeterminate and determinate varieties. That means you may need to can or preserve in smaller batches. Or, perhaps grow more plants for larger single harvests. One final note – the term indeterminate is often confused as being identical to heirloom. Heirloom refers to the quality of seed being open-pollinated. It does not refer to a plant’s growth habits. So when it comes to determinate vs. indeterminate tomatoes, remember both can be found as heirloom varieties.